Booksellers Without Borders: July Book Club: Wee Free Men, winner of Insurgent AND another giveaway! 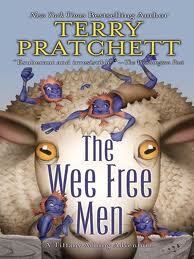 July Book Club: Wee Free Men, winner of Insurgent AND another giveaway! 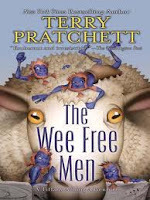 NaomiRuth has been asking us to read Terry Pratchett ever since she discovered him a few months ago, so this month we went with Wee Free Men. Tiffany is an ordinary nine year old. She enjoys making cheeses in her family's dairy, likes walking by the river, loves to learn, and is annoyed by her little brother, Wentworth. So when monsters appear in the river and little blue men start popping up all over the place, stealing sheep and speaking in riddles, Tiffany isn't quite sure what to do. Except smack the monster with a frying pan and look for answers at the travelling school that has come to town. When Wentworth is kidnapped by the fey, it's up to Tiffany to rescue him. Fortunately she joins forces with the Nac Mac Feegles - the tiny blue kilt wearing, sword wielding, ale drinking warriors that have claimed her as their kelda. 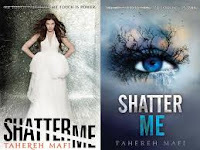 Journeying into Fairyland and through a web of nightmares and dreams Tiffany has to draw on every bit of ingenuity and knowledge she possesses to survive. What we thought about the book! Eileen: I thoroughly enjoyed Wee Free Men. Although the book was published for children it has excellent storytelling that appeals to all ages. The unusual mixture of humor, fright, and satire will definitely keep me reading more Terry Pratchett. Rebecca T: I really had fun reading this book. The Nac Mac Feegles are probably one of my new favorite fictional creatures. The dialect was fun and gave them real personality and I just loved all of the little details. Tiffany was developed well and behaved as a mature nine year old might, if you were a young witch thrown into the middle of Fairyland. I loved her hunger for words and knowledge and how do you not appreciate someone whose weapon of choice is a frying pan?! Next month we'll be reading Tahereh Mafi's Shatter Me. Rebecca T and Rachelyons are SUPER excited to see what everyone else thinks about this book!